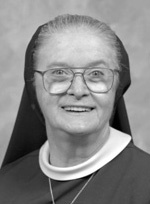 Sister Miriam Patrice Pyle, I.H.M. Sister Miriam Patrice Pyle, I.H.M., formerly Patricia J. Pyle, died Dec. 6, 2013, in Camilla Hall, Immaculata, in the 62nd year of her religious life. She was 80 years old. Born in Philadelphia, Sister Miriam entered the Congregation of the Sisters, Servants of the Immaculate Heart of Mary in 1951 from Holy Souls Parish in Philadelphia and professed her vows in 1954. Her first 11 years of teaching were spent in Arlington, Annandale and Virginia Beach, Va. She returned to Virginia later to teach at St. James in Falls Church. After teaching music in grade schools in the Philadelphia Archdiocese, she went to Villa Maria House of Studies to assist in the Spirituality Center and joined the staff at Camilla Hall. The funeral Mass was celebrated at Camilla Hall Dec. 11, 2013. Father William E. Dean was the celebrant and homilist. Sister Miriam is survived by members of her religious community. She was predeceased by her parents Clement A. and Jane G. McMenamin Pyle and siblings Clement Pyle and Joseph Pyle.